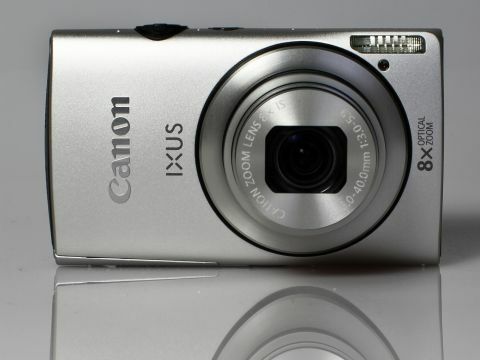 Canon's IXUS range has long been synonymous with stylishly designed compact metal-bodied cameras, such as the IXUS 310 HS, IXUS 220 HS and IXUS 115 HS. The latest line of IXUS cameras, including this Canon IXUS 230 HS and the more expensive Canon IXUS 1100 HS, sport Canon's HS technology, which uses a high-sensitivity 12.1MP back-illuminated CMOS sensor and the latest DIGIC 4 image processing engine to improve the quality achieved at high sensitivities. This technology should enable pictures to be taken in low lighting conditions, retaining the original atmosphere of the scene, without bleaching the ambient light with flash. The DIGIC 4 processor on the Canon IXUS 230 HS also has a feature called iSAPS (Intelligent Scene Analysis based on Photographic Space), which analyses the scene to best set up the exposure and focusing, slightly in advance of the picture being taken. The idea with this technology is that it should provide a more responsive experience for the photographer. The Smart Auto mode takes this further by automatically selecting the appropriate scene program for the conditions. Fast action can be captured on the Canon IXUS 230 HS with either the high-speed Burst mode, which can take 3MP shots at a rate of up to 8.7fps, or the Super Slow Motion Movie feature. Videos can be recorded at frame rates up to 240fps and played back at 30fps, albeit at reduced resolution. The main show-stopping feature is the 8x zoom lens with optical image stabilisation, which is an improvement over the 5x zoom lens fitted to this camera's predecessor, the Canon IXUS 220 HS. The lens has an aperture range of f/3.0-5.9, which is quite respectable for a slim compact with a large zoom range. Its optical image stabilisation, which is useful for stills, also works continuously during video recording to help reduce the shakiness of handheld movies. Video recording is possible in 720p high definition at 30fps. The movie files are saved in the popular iFrame format, which should make the camera as friendly for Apple computers as PC systems, because no conversion should be necessary to import the files into iMovie. The current trend for creative effects in compact cameras hasn't passed Canon by. Several effects can be chosen, including ones that recreate the look of shooting with a toy camera, a fisheye lens or a tilt-shift lens. Other more conventional effects, including monochrome and super-vivid, are also available to choose from. The Canon IXUS 230HS is available for around £230, which seems good value with all the specifications considered.